Oil on canvas, 38 x 47 cm. Anton Melbye completed a number of paintings of ships in high seas which were marked by a distinctly Romanticist sensibility. His works tended to focus on the dramatic depiction of the sea, sky and light, with the intense study of ships being a secondary concern. In this marine painting, the artist has sought to manifest an intense atmosphere at sea by highlighting the contrast between the light of the evening sun upon the water and the rocking of the waves under a menacing sky. 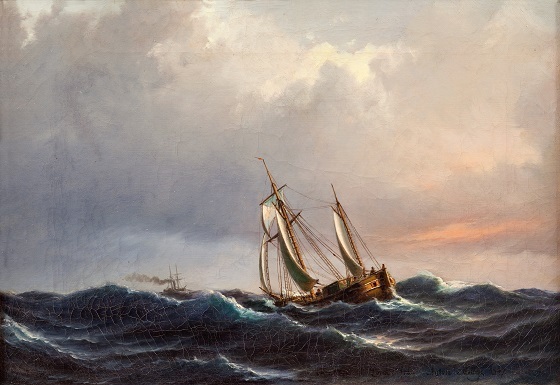 The main subject is a fishing vessel battling the stormy waves. The sails are stretched to their limit by the strong winds and the boat looks as though it is on the verge of capsizing, underscoring the tension and drama of the scene. Melbye became one of the few internationally renowned marine painters in his time thanks to his dramatic seascapes.